During last weeks internationally-renowned 53rd Leipzig Festival for Documentary and Animated Film, DOK Leipzig, Bankwatch’s most recent co-production about the European Bank for Reconstruction and Development (EBRD)-financed Kumtor gold mine in Kyrgyzstan All that Glitters collected two awards: the Mitteldeutscher Rundfunk award for an excellent Eastern European documentary film and the Healthy Workplaces Film Award for the best documentary film about the subject of work. More good news related to the film arrived today when one of the featured protagonists, the doctor Baktygul who organised community resistance after the lethal cyanide spill at the Centerra-owned mine, was acquitted of trumped-up charges by the Supreme Court of Kyrgyzstan. Yet beyond the silver screen many questions remain unanswered about what was achieved with EBRD money for Centerra and its Kumtor mine. And at another Centerra site in Mongolia, conflict emerged in early September in protest at mining in one of Mongolias few forested areas and the governments failure to implement environmental regulations regarding mining. And new financing for Centerra has suddenly appeared on the radars of the banks Board without explanation of its purpose. Bankwatch discovered yesterday the “Regional: Centerra Revolving Debt” project on the Board agenda, which subsequently was moved to the Board’s November 10 meeting, yet no project summary document or information about the project had been provided beforehand to the public. For an institution that has sustainability at the heart of its agenda and declares itself dedicated to stakeholder engagement, this recent development raises the question of whether the lessons from Kumtor are being learned. 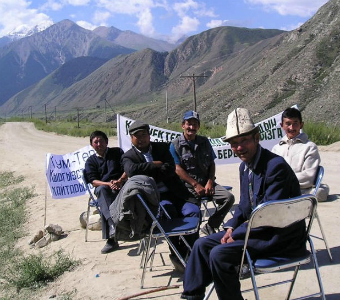 Image: Villagers demanding proper compensation for an old accident in Kumtor gold mine, Kyrgyzstan, during a blockade in August 2005.